There's still no news on when Kobo will finally let us buy the Kobo Glo here in the US, but things are looking up for Japan. Kobo has just announced that their new ereaders, the Kobo Glo and Kobo Mini, are now up for pre-order on the Rakuten website in Japan. The ereaders are going to ship on 15 November. 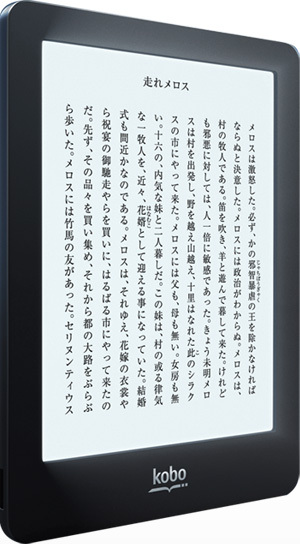 The Kobo Glo is currently listed for 7,980 yen, or about $100. That's how much the Kobo Touch had been selling for yesterday. The older ereader will be getting a price cut to 6,980 yen. Its new $87 price should make it at least somewhat competitive against the Kindle Paperwhite, which offers a better platform, more features, but also a higher price (8,480 yen). Curiously enough, the Kobo Mini is also going to be priced at 6,980 yen. That's going to give buyers an interesting set of tradeoffs. Do they want the larger but still inconsistent screen or do they want the smaller and higher resolution screen? I'd go for page turn buttons, myself, but that's not an option here. Just How Much Do the Big 6 Hate Library eBooks? Sorry not accurate – Kobo Glo and Mini are currently being rolled out to independent book stores in the U.S. Some have already received stock others are expecting them any day. I live in St. Louis and there are six independents who will be carrying Kobo ereaders at this time. I received a phone call from an independent book store in Madison WI who had received inventory from Kobo yesterday. You mean they received inventory from Ingram, the distributor. And that tidbit about the indies doesn’t help; I checked with the ABA and they’re not sure which member stores in my area have received stock. So at this point I still have no info.